Please go to Safari Books Online for a table of contents, feedback, and purchasing options. Of course, it is available at Amazon and other book stores. "The book is a good introduction to the development of embedded internet enabled applications using the Netduino. ... It is a small book but covers enough to get you going and the examples can be modified easily for different sensors on the netduino. ... The level is pitched for beginners who may not be experienced software engineers experienced with C# but the examples are simple enough to walk through with only a limited knowledge of the language. ... After you get started you can get other books that deal more specifically with networking and/or Micro Framework which are more general in hardware and detailed on .NET Micro Framework." "I really really like the writing style. It's keeping everything neat, simple and correct. It should be the manual beginners are required to read before being allowed to even mention the words IoT or WoT ;-)"
"I've done a lot of programming and implementations for many different small microprocessor platforms, various computer languages, and other programming learning exercises ranging from database to web page programming and each time I sought out the best learning material I could find and never have I had a learning experience go as smoothly as it has with Cuno Pfister's GSIOT book." "Reading this book takes me back to younger days of hacking on a Commodore-64. ... Getting Started with the Internet of Things updates this feeling for a new generation and lets you control machines linked to the rich ecosystem of the Web. ... Getting Started with the Internet of Things gives you the fundamentals and building blocks for developing any kind of "smart" device connected to the Web. What you do after the initial push is limited only by your imagination. ... The book is written clearly and aimed at moderately skilled developers. ... If you've never done any programming, this isn't the place to start. That said, you'll learn a heck of a lot about networking here, including the basic syntax of REST and the nature of web applications and services. ... Packed with code samples and linked to a community that seems invested in continuing the dialogue started in these pages, Getting Started with the Internet of Things is, in fact, a great place to start if you're interested in tackling embedded programming and device development. ... Getting Started with the Internet of Things shows you how to transform a humble piece of hardware, to participate in what the Web has to offer. Whether you're serious about the tradecraft behind this for career development, or just a curious Maker interested in dabbling, Getting Started with the Internet of Things is an essential companion to the Netduino Plus and a great place to get started with lower-level programming." 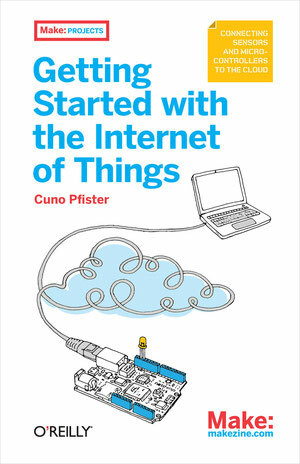 "If you want to actually start building your own internet-to-thing connections, Cuno Pfister's Getting Started with the Internet of Things is an excellent and practical introduction"
"The book gives a very hands-on experience to exemplify the principles that underpin sensor networks. This could be an excellent starting place for school and college projects, or for the hobbyist."